April happens to be Cesarean Awareness Month and so let’s kick off the month of April with an appropriate post about c-section scar tips. There is no promise that these are fix-all solutions, so please check with your doctor or midwife if you should be doing this if you’re within 6 weeks post-partum, or have an infection or feel pain in your c-section scar. Please be advised that these are some helpful tips that you may find suitable to incorporate into your routine to help you return to function and life sooner and easier! To begin, there are a few benefits from relieving tension in the scar, including reducing lower back and/or pelvic pain as well as pelvic floor issues; improve pelvic floor and core function; and help in the overall healing of abdominal separation (diastasis), and incontinence issues. Support the incision with your hands or a small towel when coughing, laughing, or sneezing etc., by pressing firmly. This will help reduce the pain and scar strain during strenuous tasks. Piston breathing exercise: 5 repetitions 3x/day. Can be performed sitting or standing. Taking a deep breath through the nose, allow the abdominal muscles and the pelvic floor to soften, relax, and belly expand. (Lett the muscles drop into the bottom of your pelvis bowl). Breathe out (pursed lips), perform a Kegel - drawing the pelvic floor up towards the head. Relax the pelvic floor when your exhale is done. Castor oil packs have been used and suggested for many years to help with scar healing and the pain/altered sensation of c-section scars. Midwifes, friends, and family may have shared the possible benefits of this treatment. Soak a piece of cotton or flannel is castor oil and place on the whole scar. Place some plastic wrap on the fabric followed by a hot pack. Keep this on for approximately 15-20 minutes. It is meant to prevent a painful scar. Put your fingers right on top of your scar and move up and down (North and South) a few times while going across the full length of the scar for about a minute. Make sure you are not stroking on the skin, but rather fingers stay on the scar as you rub it against theunderlying tissue. Going against the grain or direction of the tight tissues is known “deep transverse friction”. Same as the last except this time move your fingers side to side a few times, then relocate to a neighbouring area, slowly moving along the full length of the scar, as well for about a minute. Now move in small circles with your fingers on top of the scar, again covering small areas at a time, across the full length of your scar for a minute. Eventually, gradually with time, you want to be able to “pull up” your scar in a pinch-like motion across your scar. 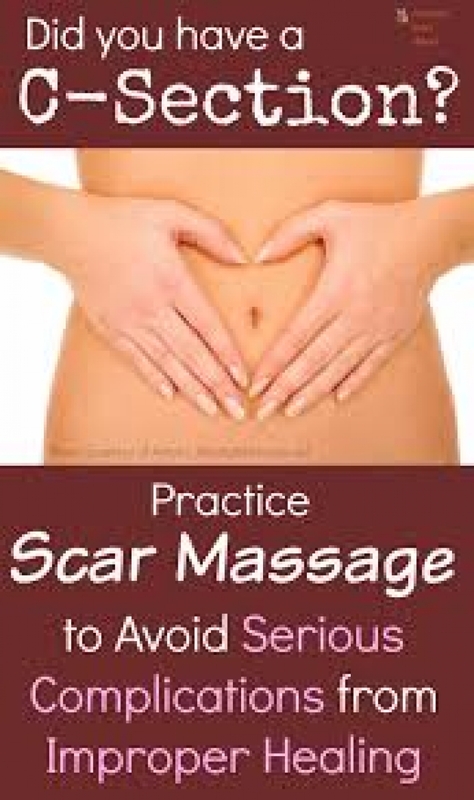 How does massaging the scar have anything to do with strengthening abdominal and pelvic muscles? The caesarean scar is usually situated on the pubic bone area. Now, the pelvic floor area begins at the bottom of the pubic bone, expands to the sitz bones (ischium) and reaches all the way to the tailbone in the back. From the interior perspective, the muscles actually reach further up and behind the pubic bone, and fill your pelvis bowl like a funnel. Abdominal muscles originate from your pelvis and spine/ribs, and wrap around to the front of the body, attaching to the pelvic floor muscles and the pubic bone region. Remember, our body is a series of chain links and changes to one link will directly affect the neighbouring links and beyond! If there is ever any tension between that region it can definitely contribute to those muscles not working as well as they could, and ultimately affecting your function and quality of life.